Many employment opportunities are available for aspirants with the Indian government. Many tests are carried out by the state and central governments. Aspirants can appear for these tests and get employed in the job of their choice. The salary of aspirants shall show a variation from job to job. Aspirants who are employed with the R&D departments of the government shall get an initial salary of Rs. 8000- Rs.10000 each month. Those who would like to go for teaching shall make around Rs. 8000- Rs.12000/-. The salaries of aspirants of this field shall be depended upon the norms of the Indian Medical Aspirants who have a graduate degree in pharmacy will be able to get better positions and get more remuneration. Their salary shall range from Rs. 8000/- to Rs. 25,000 a month. The salaries of those who are employed as lecturers or teachers shall be determined as per the norms of the government of India. Because the Bachelor of Pharmacy is a professional course, a lot of career opportunities are available for aspirants who have completed this course successfully. A fresher of this field will initially get as much as Rs.8000 to Rs.10000 a month. Then again, their salary is also depended on the performance of the students. Those who would like a career in teaching will get a remuneration of approximately Rs.10000 to Rs.15000 every month. 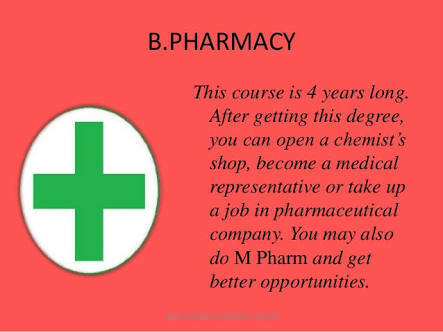 Students of M.Pharm will have the opportunity to command better salaries. They will get around Rs. 3 to 6 lakhs every year. With an experience of minimum 5 years, aspirants will be able to get a remuneration of almost Rs. 9 to 12 lakhs each year. Maximum salary varies according to student capability and experience.